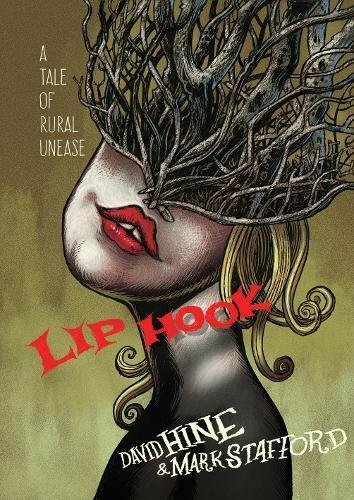 Somewhere in the British Isles, at the end of a neglected road, there is a village called Lip Hook. For its inhabitants, the village is more than the end of the road—it’s the end of the world. Beyond it, there is nothing but mist-shrouded marshland. Few travelers take the road to Lip Hook, but one foggy night, a car speeds perilously toward the village. The driver is a dangerously beautiful woman, the passenger a man with a gunshot wound and a suitcase containing a treasure he has risked his life for. Cash-strapped but in need of a place to hide, the two fugitives seek shelter at the Hanged Man Inn, where the woman persuades the innkeeper to accept payment in kind. As days pass and the woman extends her services to more of Lip Hook's men, among them the village priest, a false faith grips the community—and reason, logic, and humanity begin to disappear. David Hine has written extensively for mainstream comics, including X-Men and Spider-Man for Marvel, Batman and Green Lantern for DC, and Judge Dredd for 2000AD. For Image Comics, he created the critically acclaimed The Bulletproof Coffin (with Shaky Kane) and Storm Dogs (with Doug Braithwaite). Hine has delivered workshops on writing graphic novels in Singapore, Greece, and throughout the UK and is a visiting lecturer at VIA University College in Denmark. His Marvel book, Daredevil: Redemption, was nominated for the prestigious Harvey Award in 2006. Mark Stafford has been called “the greatest comics artist you’ve never heard of” by comics website Bleeding Cool. He collaborated with Costa Award-winning graphic novelist Bryan Talbot on Cherubs! (Dark Horse) and with the poet Ravi Thornton on HOAX: Psychosis Blues. Aside from comics, he has worked with actors and puppeteers to create theatrical posters and programs, and with borough councils and libraries to create a mural and information graphics. Stafford has been the Cartoon Museum’s cartoonist-in-residence for over 10 years, running workshops, fun days, and demonstrations.